« Xbox Live five years on – what's next? Disclaimer: MediaGate is currently a last100 sponsor. Pitched by the company as an AppleTV alternative, MediaGate’s MG-350HD shares much of the same media extender functionality, whereby photos, music, and videos can be streamed from a PC to a TV. In addition to streaming, when fitted with an internal hard drive, the MG-350HD can operate as a network attached storage device to house and playback all of a user’s home media. In the looks department, the MG-350HD is no stunner, but it’s far from ugly either. Resembling the shape of a typical external hard drive with the addition of the give-away 802.11g-compatible WiFi antenna, the device has a solid and durable feel to it. The front panel features a navigation pad, media playback controls (start/stop etc. ), status lights and an infrared receiver. The inclusion of physical controls adds clutter to the design and seems a little frivolous at first — until the day you misplace the supplied remote, that is. 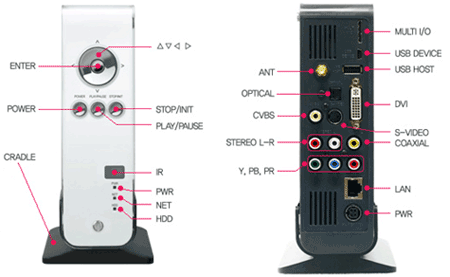 On the rear of the device are a plethora of connectivity options: including USB device/host ports, DVI out, S-Video out, digital coaxial out, component-video out, Ethernet, optical out for 5.1 audio, composite-video out, and stereo RCA audio outs. The S-Video, component and composite video options will come in handy for those without a HDTV, although, as the name suggests, the MG-350HD is geared towards a High Definition world. Unlike the AppleTV, MediaGate’s device doesn’t require a Widescreen television and can be operated in 4:3 mode. After plugging the MG-350HD into my HDTV via the DVI connection and configuring the device to work with my WiFi network, setting up the MG-350HD for streaming content from a Windows PC to a TV was fairly straightforward after a few initial hiccups caused by Firewall settings in Windows XP. Rather than requiring Media Center editions of Windows or sending everything through iTunes, MediaGate uses Windows’ standard file sharing functionality. Simply select and name which folders you want to designate as ‘shared’ on your PC and they show up in the MG-350HD’s file browser. (MediaGate also claims Mac-compatibility, which, although I didn’t attempt, involves downloading some additional software and setting up Window’s filesharing in OSX). From then on in, streaming worked as advertised, for photos and music at least. Like with all wireless media extenders that I’ve tested over years, trying to stream video files over an 802.11 b/g WiFi network resulted in a choppy picture, with an obvious number of frames being dropped. To get around this, use an Ethernet connection (which, I know, defeats the point of being wireless) or transfer files onto the MG-350HD’s optional internal hard drive or a plugged in external USB drive (see below). When bypassing the wireless connection, video playback was good, with most popular formats supported including DivX and MPEG 1, 2 and 4, although, rather disappointing, not H.264. Another potential issue for users of the MG-350HD is that the device doesn’t support Windows DRM (the copy-protection used by the majority of paid-for video download stores) nor Apple’s FairPlay. 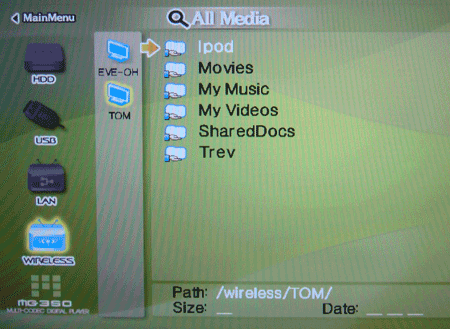 As a result, in terms of video, the MG-350HD is really only suited to DivX playback and other popular non-DRM formats. As well as playing back music, pictures and video stored locally, the MG-350HD has an Internet radio option, which pulls in MP3 streams from SHOUTcast and Ice Cast Internet radio servers. Although the device can’t match Apple’s polished user interface, easy set-up, and tight integration with iTunes, for those users willing to get their hands dirty, the MG-350HD, in a few respects, offers more flexibility than the AppleTV. The option to fit an internal hard drive — up to 750GB — as well as plug-in any USB drive externally, gives the tech-savvy user a few more options when integrating MediaGate’s device into a home network. The fact that the MG-350HD can operate as a fully fledged network storage device also makes it more scalable so that it can serve up content from multiple PCs, without the need for iTunes or Windows Media Center to act as a gatekeeper. In addition, the MG-350HD suports DivX playback natively, something that the AppleTV can’t do without hacking the device and voiding your warranty. The MG-350HD can be picked up online for around $220, and for those willing to live outside of the iTunes / Windows Media Center ecosystems, offers an affordable alternative to other PC to TV devices on the market. Note: If you have a cool piece of hardware you’d like us to check out, please get in touch. Can folders be renamed/edited? and can u password protect certain video/photo folders? Yes, when you connect the MG to your PC via USB (I have not yet tried wireless, only just got my WLAN card card working after months of driver issues and no time to fix), it shows up in the My Computer menu as just another drive. You can move ANY data (regardless if its format will be recognised by the unit or not) to, or from the MG, as well as cutting, pasting and copying things around within the MG’s hard drive. This includes renaming, creating and deleting old files or folders. No, I do not believe that this is available as a function the MG. I have played around with the unit a lot, and spent some time on the MG forums and have not seen any information indicating that this unit is able to password protect certain files or folders.